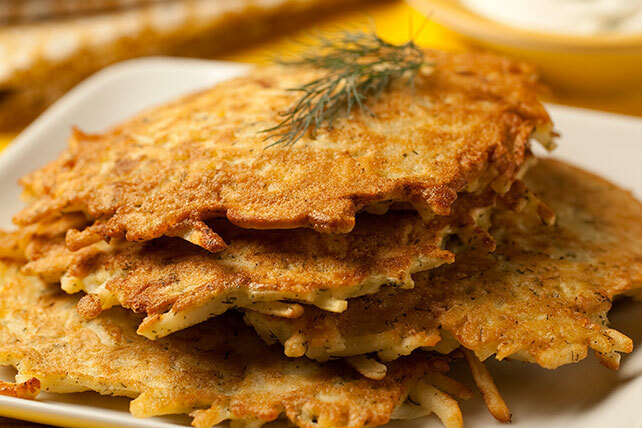 Switch up your usual morning routine with these simple Breakfast Potato Pancakes. Top these Breakfast Potato Pancakes with sour cream for amazing flavor. Combine potatoes, onions, egg, flour, dill weed and pepper. Heat 2 Tbsp. oil in large nonstick skillet on medium heat. Drop half the potato mixture into 4 mounds in skillet, using about 1/3 cup potato mixture for each mound; flatten with back of spatula. Cook 3 to 4 min. on each side or until pancakes are golden brown on both sides. Transfer to plate. Repeat with remaining oil and potato mixture. Serve topped with sour cream. Garnish each serving with chopped fresh chives.